The four-volume Encyclopedia of Society and Culture in the Ancient World offers comprehensive coverage of the ancient world, from prehistory to the fall of Rome, including Western and non-Western cultures and civilizations. An introduction outlines the key milestones in the development of human society, from the peoples of the Ice Age whose way of life was so vastly different from ours to the citizens of Greece and Rome whom we easily recognize from history books. The 69 signed entriesincluding 14 on "major" topics with more in-depth coverageprovide readers with an overview of the various ways in which people lived in the past. 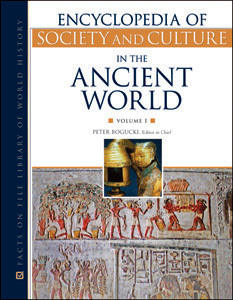 Each entry explores a specific topic across the entire world, beginning with an introduction that outlines the major developments in chronological sequence, followed by subsections on the following centers of civilization: Africa, Egypt, the Middle East, Asia and the Pacific, Europe, Greece, Rome, and the Americas. Each entry concludes with a list of "see also" references to related entries, followed by a further reading list of books, articles, and Web sites on the topic. Primary source documents, sidebars, and more than 250 black-and-white photographs and maps supplement the text. A glossary, general bibliography, chronology by region, and comprehensive index make this set an easy-to-use and essential reference for high school and college students, researchers, and general readers alike. "...a well-written and -constructed encyclopedia designed to facilitate cross-cultural studies. Appropriate for high school and undergraduate libraries." "...provides a solid foundation for further exploration...Public, high school and college libraries will all want to consider adding it to their collections." "...comprehensive, engaging, and well-researched...[a] masterful investigation of remarkable civilizations. Exhaustive yet accessible..."
"...a handy source for those seeking a broad overview of areas of life in the ancient world. Recommended." "...comprehensive coverage of the ancient world...Recommended."